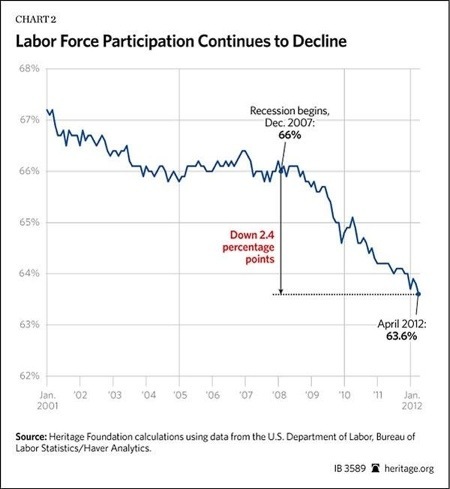 This is a graph of the number of people in the US who are in the labor force…that is, working or looking for work. When people drop out, they are not counted as unemployed, hence the reason the number of people out of work has soared, but the official unemployment rate has not. Notice too that the big decline started after Obama took office, not before as his reelection campaign would have you believe. Official statistics can be manipulated in so many ways, and official unemployment seems to be one of the favourites of governments. I see that Wayne Swan is reportedly going to start handing out more so-called “one-off payments” after tonight’s budget. I remember when the federal government was not in debt and claimed that the best way to stimulate the economy was to plunge the government in to debt by sending everyone a one-off $900 cheque, along with the various other spending debacles like the pink bats, school shade cloths and overpriced digital set top boxes. It didn’t help…the Australian economy is worse now than it was in 2009, mostly due to the government’s actions. Now the government is in serious amounts of debt, and Wayne Swan promises a surplus which might make the surplus smaller, except for the fact that most, if not all, of the surplus comes from budget tricks rather than actual savings. But instead of doing the responsible thing and paying off as much of the debt as is feasible, he wants to hand out more one-off cheques…he must sense an election coming soon. It just proves that these payments, like the stimulus payments, had nothing to do with responsible economic management, and everything to do with bribing voters to overlook serious incompetence in the government. I’ll tell you right now Andrew, the man who once told Alan Jones that “traffic jams cause inflation” will not be the Treasurer once the people have had their say at the ballot box, no matter how much money he borrows to bribe the voters.